When young programmer Alexander Ivanovich Privalov picks up two hitchhikers while driving in Karelia, he is drawn into the mysterious world of the National Institute for the Technology of Witchcraft and Thaumaturgy, where research into magic is serious business. And where science, sorcery and socialism meet, can chaos be far behind? 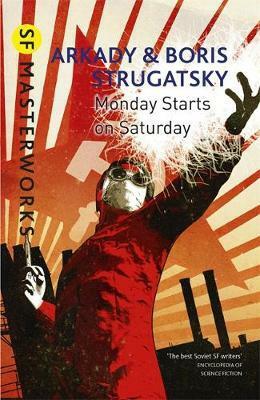 Arkady and Boris Strugatsky began to collaborate in the early 1950s after Arkady had studied English and Japanese and worked as a technical translator and editor, and Boris was a computer mathematician at Pulkova astronomical observatory. The Encyclopedia of Science Fiction describes them as 'the best Soviet SF writers' and works such as Hard to be a God, Definitely Maybe, The Snail on the Slope and Monday Begins on Saturday are powerful and poignant novels that continue to amaze and move readers. Andrei Tarkovsky's much admired film, Stalker, was based on their most famous work, Roadside Picnic.